Real Madrid prodigy, Vinicius Junior, has claimed that he chose Los Blancos over their arch-rivals Barcelona because of the better project. The Catalan giants offered him more money but Vinicius chose to play for Real Madrid. 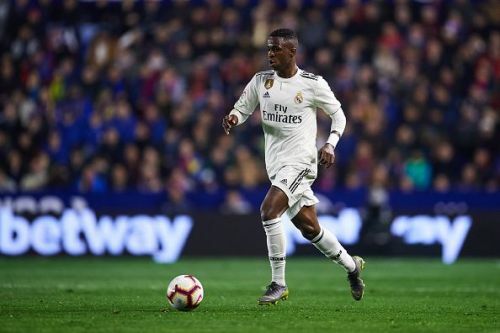 Despite the fact that Real Madrid suffered an abysmal season considering their sky-high standards, Vinicius Junior has been one of the bright spots for the club. The 18-year-old Brazilian showed his caliber when he was given the chance to prove his talent by former coach Santiago Solari. Vinicius scored just three goals but managed to provide 12 assists in all competitions and had a huge impact with the Los Blancos side. His dazzling runs on the left flank and chemistry with Karim Benzema played a major role in breaking down opponent's rearguard till he suffered from a major ankle injury. The Brazilian prodigy signed for Real Madrid in 2017 but arrived from Flamengo after the end of 2017/18 season. Speaking in an interview with Cadena Ser, Vinicius Junior revealed why he chose Real Madrid over Barcelona despite the Catalan side offering him more money. The Real Madrid star said (via Goal): "My father never told me of interest until Barcelona and Real Madrid. Then we visited both clubs and liked them both." "Casemiro told me that, when Zidane spoke, he would get a bit nervous. It is quite different how Zidane speaks compared to Solari. He is a legend, he won everything and he is special." Vinicius Junior will return from his injury in May and will have to be patient to get his chance under the new manager. Meanwhile, Real Madrid host Huesca next in the LaLiga, after the international break.